Updated 4 August 2011, 3:45pm Eastern, with the following: Bibi meets Lefty J-Streeter…… The Video. Original posting from 3 August 2011. At what point are these dangerously suicidal people removed from office ? Choo gotta bee keedeenk me, maing !?! Daniel Shapiro, the new Arabic and Hebrew-speaking US ambassador to Israel, presented his credentials to President Shimon Peres Wednesday. Daniel Shapiro, a personal appointment of President Barack Obama and who speaks both Arabic and Hebrew, was happily welcomed Wednesday by President Shimon Peres, known as Israel’s Number One seeker of peace agreements. Shapiro’s political and Jewish backgrounds fit the visions of Presidents Peres and Obama. 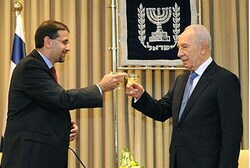 “I consider President Barack Obama…a friend of the Jewish people and the State of Israel,” President Peres said. Unless the sane amongst us immediately stand up and take back the reigns, Israel and The Jewish People are doomed. There is NO PLACE in Israel or America for pacifists, ‘peace-at-any-price’, anti-Semitic and suicidal self-hating nation-hating elected or appointed officials. Update, 4 August 2011, 3:45pm Eastern. The video should be officially titled as: ‘Bibi says hi to the enemy’. This entry was posted on Wednesday, August 3rd, 2011 at 08:43 and is filed under Main Postings. You can follow any responses to this entry through the RSS 2.0 feed. You can leave a response, or trackback from your own site. I hope & pray Bibi never caves in under the pressure from America or pressure from within , to try to trade land for peace! The world will hate Israel no matter what they do , because the world hates God .